Good morning, Friends! I hope you had a fantastic weekend and are ready for a new week! Seems like those weekends just fly by! The boys lost their soccer game yesterday. And that was a real bummer! It means that we won't be in the State Cup tournament. :( I know the boys really wanted to win. I guess they will have to try it again next year. So now we just play the games for the season and hope that we win our division and can move up to the next level. And so our busy soccer season begins! The weather yesterday felt like summer almost! Wow! We were really hot and I didn't dress accordingly. I finally took off my shoes to help cool down a bit. I got sunburned on my feet - lol!! It felt so good! But now it is supposed to snow again on Tuesday (in Denver, rain in our area). Yep! It's that crazy spring weather!! Today's card was one that I had made quite a while ago. 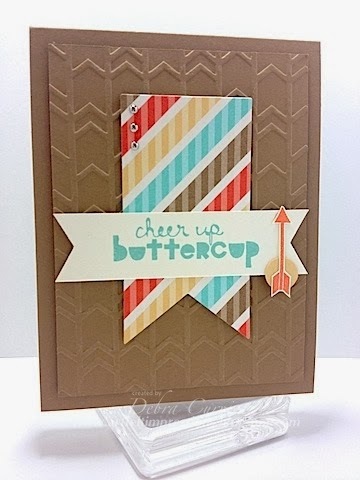 It was inspired by the sketch at Paper Craft Crew Challenges.